Making the Rear Axle :: Go-kart powered by a lawnmower engine! Below are the next 3 drawings from the total of 21 in this complete set of Kart Plans focusing on the rear axle. The Rear Axle is more complicated than the front axle. 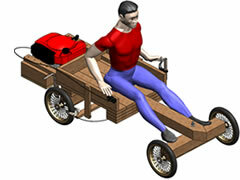 The rear axle used here is referred to as a "live axle" because the entire axle rotates. The rear wheels are welded/bolted to the rear axle. The full axle and wheels all rotate together. To stop the axle moving side to side, and to allow the axle to spin freely, special metal "bushings" are used (also called Journal Bearings). 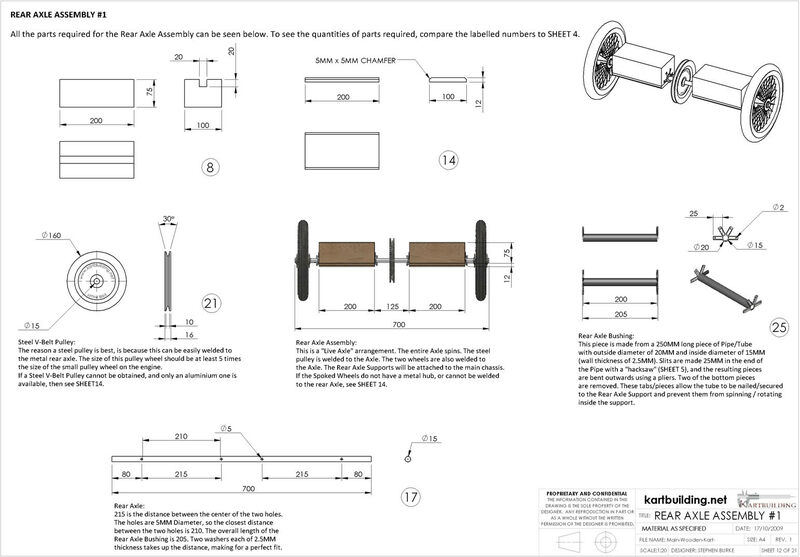 Drawing 12 shows the assembly of the rear axle and all the parts required to get the rear axle working. 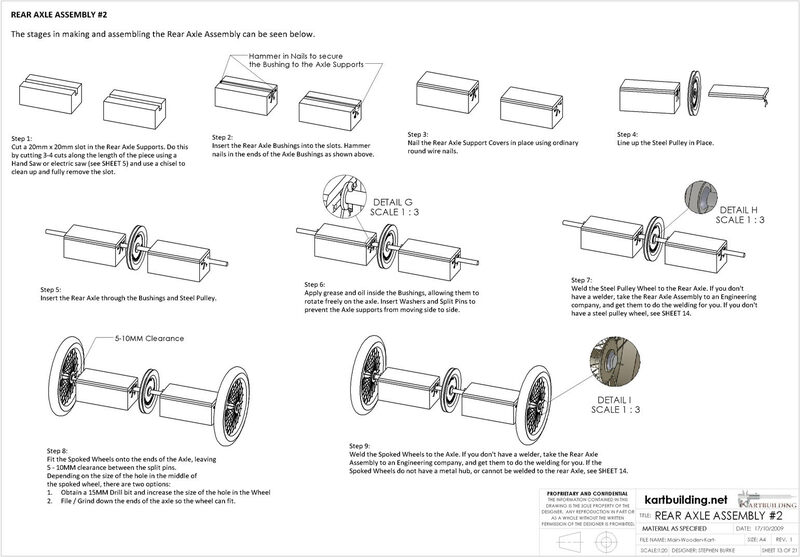 Note: wherever it says "SHEET" it refers to "Drawing ##" where ## is the number of the drawing in these plans. 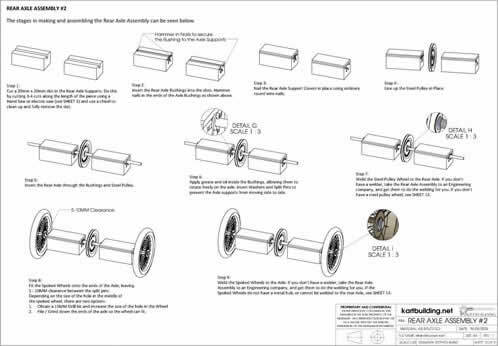 The assembly of the rear axle is shown, step by step in this drawing. The rear axle is a seperate unit which can be attached to the chassis at a later stage (next section). Again as with the Front Axle, make sure to apply plenty of oil and grease to the inside of the Bushings shown in Step 5. 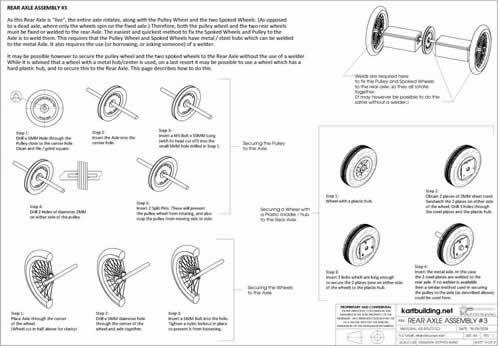 As the wheels and pulley must be secured / fixed to the rear axle, so they all turn togther, this can be quite difficult to do, especially if the pulley wheel or wheels are made from aluminium which can't be welded to the steel axle. 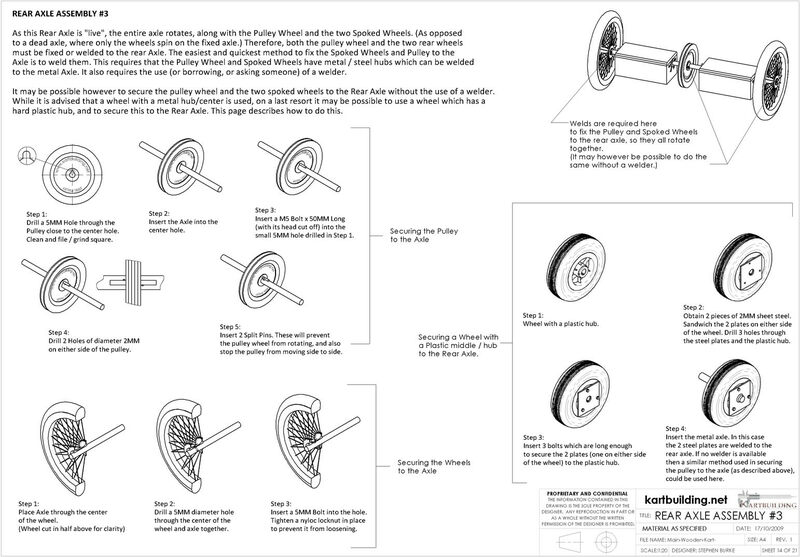 This drawing shows alternative methods of securing the pulley and wheels to the rear axle. Although they are not ideal or best methods, they may work for you. If you discover or know of any better methods, just drop us an email with the details, and it will be added to this webpage to help fellow kart builders.